For several years there has been a demographic change that we call digital transformation. Changes that we experience through digitalisation affect all areas of life: living environments, the state, economy, working live, research and development, education, art as well as media. Everything changes or needs to change even our safety. 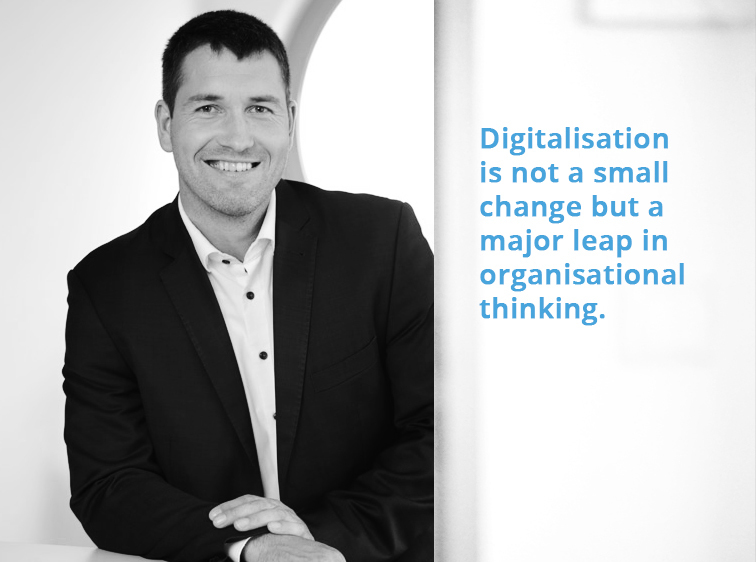 Thereby one of the most important question is: How can we profitably benefit from the topic digitalisation for our customers as well as for us as consultancy from our employee’s perspective? Specifically it is a question of which business purpose and corporate goals are improved, fanned, and optimised through digitalisation. Also, it is about which possibilities are suitable for customers through digitalisation. Again and again we determine that even in times of digital change objectives that are made by organisations do not change fundamentally. Both competitiveness by sales optimisation and cost and profit improvement are and will remain key objectives. In order to achieve these objectives, we need to ask how the technology of digitalisation can be used. This means: what value and possibilities can subjects as for instance big data, cognitive intelligence, social media, mobile business or cloud-solutions offer in order to realise cost synergy and potential concretely. Using these new digital solutions so that organisations also can benefit from requires a digital business transformation within an organisation. How do companies and our customers prepare themselves for the digital future? The answer is randomly multifaceted but with the following questions for concrete “use cases” it may be deducted which subjects matter within organisations. What does for instance vary within an organisation’s core and support processes by the use of big data – and in the further expansion stage by cognitive intelligence? What possibilities arise by the use of chatbots or other social media options at the customer interface? In which infrastructural forms do I save masses of data and where, at which provider, if I want to do it by myself? Is cloud as „As-a-Service“ offer of various providers the measure of all things? How am I able to integrate mobile devices within my processes, for example within asset-intensive industries in order to optimise my processes or design services more cost effectively and efficiently? Either way. At all these questions and so called „use cases“ do not only identify opportunities but also understanding risks is important. Once technologies are used they arise. There is nothing new about the importance of digital transformation to the economy. Already at the IT summit in Berlin in November 2015 the subject has been taken up. It was about how we design digital future. The digitalisation is and remains a key challenge to the society and economy within the upcoming years. Organisations need to be credibly at the market as well as agile. The digitalisation ensures high competitive pressure so that business models need to be continuously modified and expanded. Insofar agility and digitalisation can be describe as kind of a “new currency” that fires entrepreneurial competitiveness. Besides it is necessary to develop and qualify its employees constantly. This is the only way to meet challenges. What characteristics do successful business transformations require? What knowledge exists in-house regarding the topic digitalisation? Are relevant tools already deployed for example for communication among each other and with its customers? Are social media and sales platforms already deployed for sales purposes? For sure there are further questions that all should be written down in advance of such a project. Nowadays almost everywhere there is knowledge in the form of data and information. Nevertheless, this is not enough. Rather it is about intelligent linking of knowledge with employee’s experiences and capabilities. It is important to enable them putting this combination into practice for the organisation. Because only then the condition is created in order to handle upcoming transformation trustworthily. Also consultancies need to be trustworthily in this context. 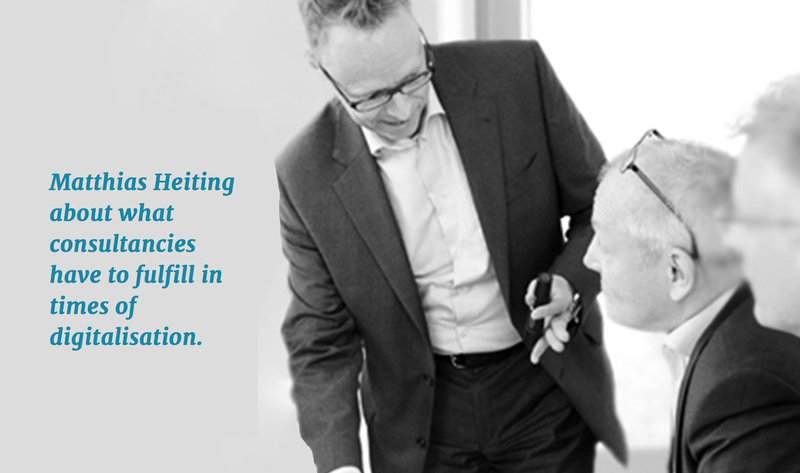 Disclosing knowledge and making recommendations – this is what a trustful company should be based on in my view. Consultancies are aware of solutions and technologies that run successfully either in-house or at other customers. In addition, necessary “change” that organisations need to implement often is a major challenge in reality. Hence, support by experienced implementation experts often is the safest solution. Of course is it about strategies but primarily it is about concepts and implementation strength of experienced employees within agile project structure. As said before: agility is the new currency for success. Consultancies using agile methods often are able to mediate and anchor these in established processes in a better way. What characteristics do external consultancies need to have? Quite a few consultancies will also have to redefine themselves at least a bit and rebuild their consulting real net output ratio. Then they will be able to satisfy their customer’s future requests. This includes large as well as small and medium-sized consulting companies. Not for nothing a number of consulting companies have begun to found digital branches in order to close portfolio gaps and to maintain its top position. The world of consultancy will be more colored and diverse for sure which is good. The knowledge of consulting companies essentially takes place in their employee’s heads supporting projects. To invest in this, to renew and expand existing knowledge again and again, using and adapting it to its customer’s need and finally selling it – this is what we see as our key to success at AXXCON more than ever.